There is no time to rest for Eliza D. Braun and Wellington Thornhill Books. The man who has haunted and hounded them since the fall of the Maestro, Doctor Henry Jekyll, is now on a killing spree, using bizarre, theatrical murders as a way to taunt their inability to capture him. It falls on Books and Braun to turn the tables on Jekyll and bring him to justice. As Wellington and Eliza continue their pursuit of the madman, Jekyll, the Ministry of Peculiar Occurrences stand against a recent surge in House of Usher activity. 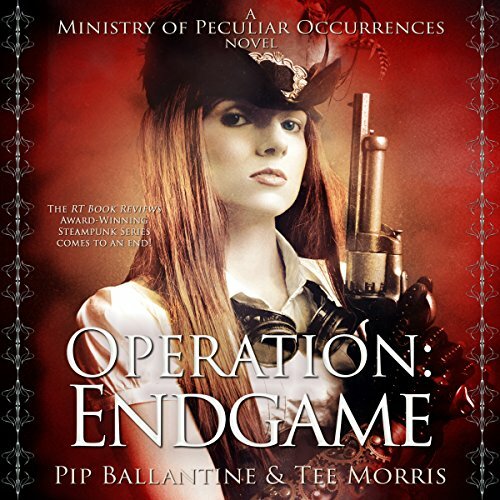 Agents Bruce Campbell and Brandon Hill discover more about the intention of Operation: Ragnorok, and the Ministry find themselves in a race to thwart Usher’s intent to plunge the world into chaos, despair, and a noticeable lack of clotted cream for Devon Teas. While I understand some of the reasons an author would want to read their own books, I have a hard time with Miss Ballantine's presentation of the characters. The voices of the Canadian and Aussie agents are extremely unrealistic and distracting. She also slows the story and doesn't have the continuity and excitement of the beginning of the series. I preferred when James Langton read the first 4 novels in the series. His character portrayals were much more realistic and his reading was exciting and fun. The book itself is good, but I had a hard time with the narration. Please choose a real Audible Narrator ! I was so looking forward to this installment but I am really having trouble listening to it. I am so surprised actually for I didn't realize how really talented your narrators are - until you hear someone who is not a professional narrator. In this author's reading, it is a challenge to tell the voices apart and after so many with one narrator - it It is very difficult to shift to such a monotone delivery. Please consider re-recording??? Enjoyed your books at first, then you thought you could read them, you can’t, and you can’t seem to Finish story. I will not be fooled by you guys again. Please Please Please pay a narrator. The last two books have dragged because of the author narrating.